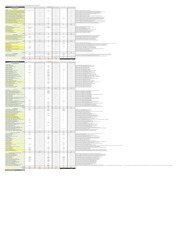 Last database update: 22 April at 15:34 - Around 230000 files indexed. 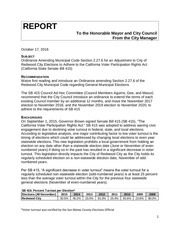 Staff Report on changing CC election 101716 REPORT To the Honorable Mayor and City Council From the City Manager October 17, 2016 SUBJECT Ordinance Amending Municipal Code Section 2.27.6 for an Adjustment to City of Redwood City Elections to Adhere to the California Voter Participation Rights Act (California State Senate Bill 415) RECOMMENDATION Waive first reading and introduce an Ordinance amending Section 2.27.6 of the Redwood City Municipal Code regarding General Municipal Elections The SB 415 Council Ad Hoc Committee (Council Members Aguirre, Gee, and Masur) recommend that the City Council introduce an ordinance to extend the terms of each existing Council member by an additional 12 months, and move the November 2017 election to November 2018, and the November 2019 election to November 2020, to adhere to the requirements of SB 415 BACKGROUND On September 1, 2015, Governor Brown signed Senate Bill 415 (SB 415), “The California Voter Participation Rights Act.” SB 415 was adopted to address waning civic engagement due to declining voter turnout in federal, state, and local elections. 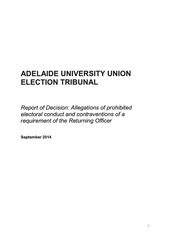 I was also hugely involved in the 2015 General election. 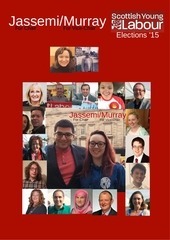 I helped build a strong team in Glasgow Central and made a lot of friends on the way! We're thus used to the elections, political election effects, presidents and political leaders. 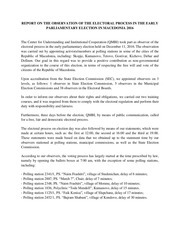 30 OFFICE OF THE CONSTITUTIONAL COMMISSION COMMISSION ON ELECTIONS ELECTION IMPLEMENTING RULES AND REGULATIONS 2016 BY THE COMMISSION ON ELECTIONS ON THE ACTIONS, DUTIES, AND RESPONSIBILITIES OF THE COMMISSION, CANDIDATES AND INVOLVED ENTITIES FOR THE ENTIRE PICE-PUPSC ELECTION PERIOD FOR AY 2016-2017 ARTICLE I. 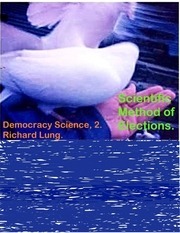 When no candidate initially obtains a majority of first choice votes, rank-ordered preferences are used to “instantly” calculate a winner without requiring a separate runoff election. Recent evidence shows that the actions of a Foreign Government to create discord in America’s democratic institutions (through the release of stolen information and the dissemination of false information) to accomplish a specific political outcome, proves that the most basic and essential foundation in order to have a democratic election, the access to fair and unbiased information, did not exist during the 2016 Presidential Election. 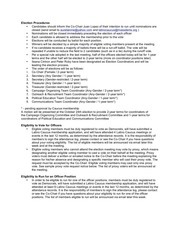 Election MDP Latino Election Procedures • Candidates should inform the Co-Chair Juan Lopez of their intention to run until nominations are closed (send email to aurelianine@yahoo.com and latinocaucus@massdems.org ) • Nominations will be closed immediately preceding the election of each officer	• Each candidate is allowed to address the membership prior to the vote	• Elections will be conducted by ballot for each position. There has been a plethora of research conducted on the effects of political campaign expenditures on congressional election outcomes. 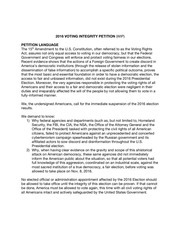 The president, however, is elected by direct universal suffrage (a constitutional amendment in 1962 established the direct election in the president). 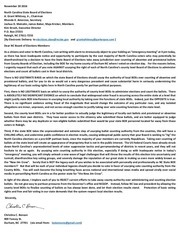 As a citizens and voter in North Carolina, I am writing with alarm to strenuously object to your holding an “emergency meeting” at 4 pm today, as there has been inadequate notice and opportunity to participate by the vast majority of North Carolina voters who may potentially be disenfranchised by a decision to have the State Board of Elections take away jurisdiction over counting of absentee and provisional ballots from County Boards of Election, including the BOE for my home county of Durham NC where I voted on election day. 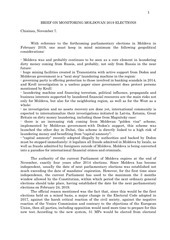 Report Observation of parlamentarian election 2016 REPORT ON THE OBSERVATION OF THE ELECTORAL PROCESS IN THE EARLY PARLIAMENTARY ELECTION IN MACEDONIA 2016 The Center for Understanding and Institutional Cooperation (QMBI) took part as observer of the electoral process in the early parliamentary election held on December 11, 2016. 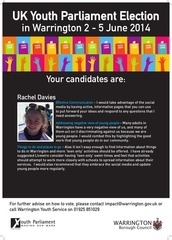 Rachel Davies poster Stand in UK Youth Stand in UK Youth Parliament election Parliament election UK Youth Parliament Election Stand in UK Youth Stand in UK Youth in Warrington 5 June 2014 Parliament election 2 -Parliament election ? 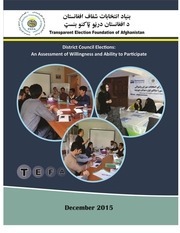 District Council Elections Report English Project Design and Direction Transparent Election Foundation of Afghanistan (TEFA) Report Author Lucile Martin, Saeed Parto and Avrohom Simons Editor Sughra Saadat Assistant Authors Mohammad Saber Khyber, Zahra Qasemi, Baryalai Qayoumi and Ehsan Saadat Fieldwork TEFA’s provincial coordinators team Report Design Zahra Abdullahi December 2015 2 About TEFA Transparent Election Foundation of Afghanistan (TEFA) is a network of 43 civil society organizations and the largest national independent electoral monitoring organization working to ensure election processes are transparent and undertaken in a democratic way in compliance with rules and regulations. Some proponents of municipal election reform advocate for the adoption of Instant Runoff Voting (IRV), a method that allows voters to rank multiple candidates according to their preferences. ● If you can vote in the general election, you can also vote in any one primary. 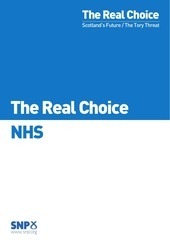 The Real Choice The Real Choice Scotland’s Future / The Tory Threat The Real Choice NHS LABOUR’S WARNINGS ON FUTURE OF NHS Labour on Conservative’s pre-­‐election NHS plans Labour’s	warnings	on	the	plans	of	the	Conservatives	to	pursue	austerity	driven	cuts,	privatisation	of	the	NHS,	and	patient	charging	pre-­‐dates	the	coalition	government	in	Westminster	coming	to	office. Couverture	journalistique	(web)	(30) Presse	écrite	(20) The	Gazette 2012-09-05	-	The	Gazette	has	learned	that	Richard	Henry	Bain	(at	right)	of	Mont-Tremblant	is	the	principal	suspect	in	the	election-night	shooting	at	Metropolis	theatre	as	the	PQ's	Pauline	Marois	gave	her	victory	speech. 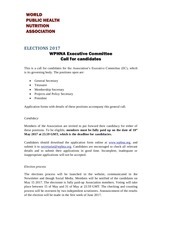 Election process The elections process will be launched in the website, communicated in the Newsletter and though Social Media. 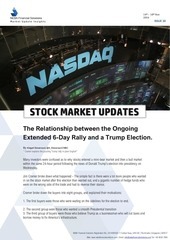 weekly update 1th Nov 2016 stockmarket 14th - 18th Nov 2016 ISSUE 10 Market Update Insights STOCK MARKET UPDATES The Relationship between the Ongoing Extended 6-Day Rally and a Trump Election. 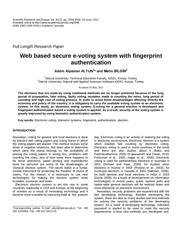 In this study, an electronic voting system, E-voting for a general election is developed and fingerprint authentication based e-voting system is applied.